Hi, I am interested in your 1965 Chevrolet C/K Truck (stock #5131-CHA) listed on Autotrader for $37,995. I'd like to get more information about this vehicle and confirm its availability. Its alright to stop and stare at this 1965 Chevrolet C10 pickup, because we all will, too. Thats what happens when you have an adjustable suspension that can be set to kiss the ground. 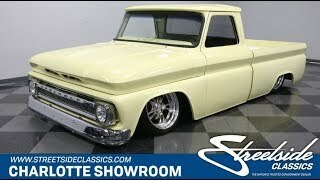 But as you look over all the details from the shining V8 to the custom bed you see this truck has far more invested in it than just its stance. Being able to pull up to a cruise-in and being able to drop your car down low right on demand looks terrific, but it takes a lot of work to get there. First, it must look the part of a cool custom. That means an ultra-smooth body free from trim and even the door handles. The brightwork that does remain on the front bumper and grille has a mirror-like finish to make sure everyone sees it. And youve got a great set of Billet Specialties wheels that look great when the suspension is high enough to see it all or when they are neatly tucked under this truck. In fact, tucking thee wheels inside is an art form all on its own. For example, in the rear, the bed needs to tubbed to accept the wheels, but they took this truck one step further. In keeping with the smooth theme, the bed is a custom piece with smooth curves inside and a fully integrated tailgate. If lowering the car didnt already wow the onlookers, then youll certainly get all the attention once you open the using the remote key fob popper. The interior is just like the exterior: sleek, simple, and stylish. The exterior Butternut Yellow is now joined by a nice black in the carpeting, door panels, and upgraded bucket seats. You get a grippy Lecarra steering wheel, and beyond that are crisp Dolphin gauges set in a bright panel. The engine bay is also ready to show off. Not only do the color-matched inner-fenders have a smooth look to funnel your attention to the V8, but theres also another secret. Most low-ridding trucks often dont have inner fenders because of the amount of suspension travel needed, so this one has a much cleaner overall presentation. Plus, the motor has a terrific shine on the ribbed air topper, matching valve coves, bright intake, and more. And while youll love this trucks showmanship, it also is built to run. The 350 cubic-inch motor has an Edelbrock four-barrel carburetor, upgraded intake, and headers feeding the dual exhaust. Plus, the three-speed automatic transmission, power steering, and front disc brakes make it easy to show this one off everywhere. This is the kind of cool custom that gets all eyes on you. So if you love an attention-getter, dont let this pickup slip away. Call now!